Lars Thorson was born in Linkoping, Sweden, and quickly made a name for himself in the sport of snow skiing. 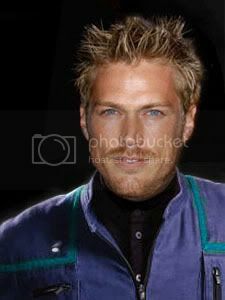 His downhill runs were truly a flight of grace, and he won a gold medal for men's slalom in the 2148 Olympics. Outside of skiing, Lars' was, using his own words, a "space cadet". He read everything about it he could get his hands on, and instead of going to Oslo University as he'd discussed with his parents; he applied immediately to Star Fleet, preferring to go straight to the source. He graduated from the Academy with Honors, applying himself with everything he had, in order to make his dream come true. Upon graduation, he continued in his studies at Jupiter Station, and even skied the icy slopes of Europe -- a stunt which earned him a mark on his record. "I'd do it again in a heartbeat," Lars said, a faraway look in his eyes. "It was worth it." After he completed his studies on Jupiter Station, Lars applied for a berth on a starship, but was turned down. He applied himself even more, and made many more applications. While he waited, he redid the maps of known space visible from the environs of Jupiter. These quickly became Star Fleet standard. Finally he was accepted aboard the NX-04 Challenger ... his friends joked that the Commandant just wanted to get rid of him and his pesky applications. Lars laughed right along with them. Who cared why? He was *going*.